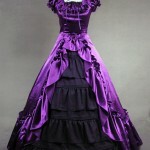 Do you know victorian fashion ? 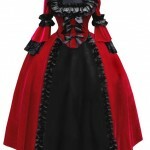 Do you know victorian costumes how to development? 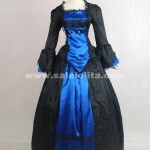 In 1830s to 1900s, Victorian costumes throughout the Victorian era. The period saw many changes in fashion . 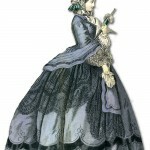 In the 1840s and 1850s, women’s gowns had wide puffed sleeves. Dresses were simple and pale, and incorporated realistic flower trimming. 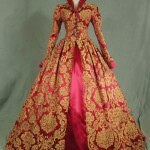 Petticoats, corsets, and chemises were worn under gowns. 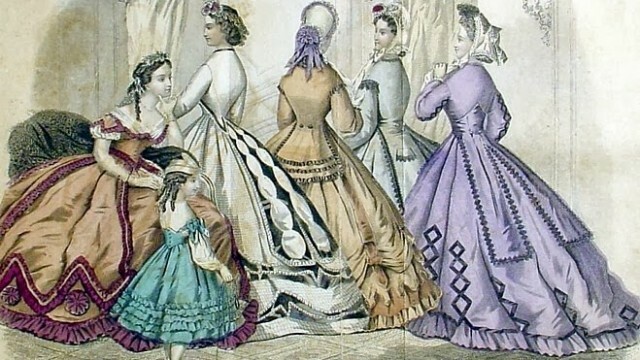 By the 1850s the number of petticoats was reduced to be superseded by the crinoline, and the size of skirts expanded. Day dresses had a solid bodice and evening gowns had a very low neckline and were worn off the shoulder with shawls. In the 1860s, the skirts became flatter at the front and projected out more behind the woman. Day dresses had wide pagoda sleeves and high necklines with lace or tatted collars. Evening dresses had low necklines and short sleeves, and were worn with short gloves, fingerless lace or crocheted mitts. In the 1870s, un-corseted tea gowns were introduced for informal entertaining at home and steadily grew in popularity. 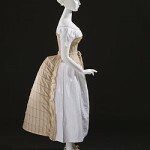 Bustles were used to replace the crinoline to hold the skirts up behind the woman, even for “seaside dresses”. The fad of hoop skirts had faded and women strived for a slimmer style. The dresses were extremely tight around the corseted torso and the waist and upper legs; Punch ran many cartoons showing women who could neither sit nor climb stairs in their tight dresses. The crinoline was replaced by the bustle in the rear. Small hats were perched towards the front of the head, over the forehead. To complement the small hat, women wore their hair in elaborate curls. Some women wore hairpieces called “scalpettes” and “frizzettes” to add to the volume of their hair. In the 1880s, riding habits had a matching jacket and skirt (without a bustle), a high-collared shirt or chemisette, and a top hat with a veil. Hunting costumes had draped ankle-length skirts worn with boots or gaiters. Clothing worn when out walking had a long jacket and skirt, worn with the bustle, and a small hat or bonnet. Travelers wore long coats like dusters. In the 1890s, Women’s wear in the last decade of the Victorian era was characterised by high collars, held in place by collar stays, and stiff steel boning in long line bodices. By this time, there were neither crinolines nor bustles. Women opted for the tiny wasp waist instead. 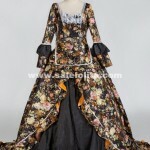 Where to find victorian civil war era ball gown?